Three part series showing the west face of Agasthyamalai from the pilgrimage rest area at Athirumalai. The images were originally shot with a 35mm point & shoot camera on print film (Fujicolor) and then scanned (rather poorly). (February 2002). Before I came to Sri Lanka and got to know Sri Pada so intimately I was drawn to a surprisingly similar, yet little known, mountain of great significance in the southernmost Western Ghats. Agasthyamalai, as I have written in the past, is no ordinary mountain. It is a mountain with unique physical, biological and spiritual dimensions. Many other mountains in the Western Ghats dwarf its 1,868-meter peak. Yet Agasthyamalai has an aura that transcends simple height and size. 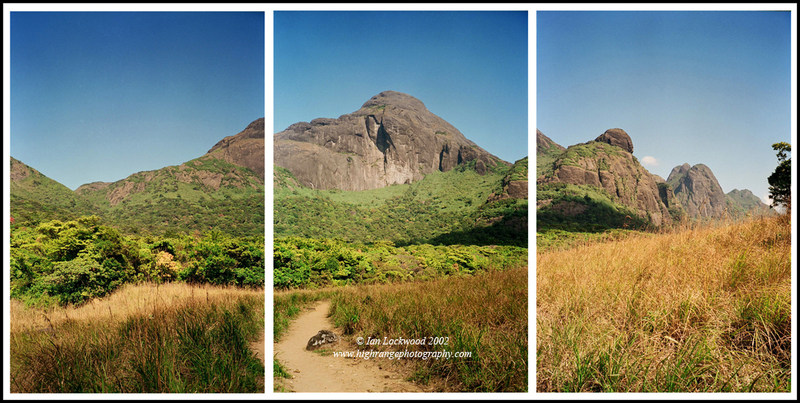 It stands sentinel amongst the craggy ridge that makes up the Ashambu Hills that lie south of the Shenkottah Gap. The area around Agasthyamalai is well know for its high levels of biodiversity and multiple habitats that are spread over Tamil Nadu and Kerala’s border region in protected areas such as Kalakad Mundanthurai Tiger Reserve (KMTR) and Neyaar and Peppara Wildlife Sanctuaries. Ten years ago I took a sabbatical year off from teaching to better explore and document the ecology, landscapes and culture of the Western Ghats, from Kanyakumari up to Mahbaleshwar. In particular I wanted to get to know the environs of Agasthyamalai better and realized that it would take patience and numerous trips to various state capitals and New Delhi to get the required letters. I may have lived in India for most of my life, be married to an Indian and speak bits and pieces of several Indian languages but my pale complexion always seems to raise suspicion in officials on the lookout for neo-colonial bio- thieves. Nevertheless, my efforts were rewarded and I ended up taking four or five different trips into the area during that year. An account of the most memorable trip was published in Sanctuary Asia and I later wrote an overview of the area for Frontline. However, I still have several images that have not made it into publications and that are worth sharing now. My motivation in revisiting those trips to Agasthyamalai came from ATREE, the Bangalore-based conservation research organization, that has used several of my images and writing in its recently published Agastyar newsletter on the area. This summer I met several member of the KMTR team, including Soubadra Devy, while visiting ATREE’s GIS lab and head office in Bangalore. Their focus in this issue is on the religious pilgrimage in the KMTR area, something that poses delicate conservation challenges given the emphasis on involving the community in conservation efforts. Cover images from Agastya, ATEE's handsome newsletter on their conservation work in the KMTR area. The images shows pilgrims preparing a puja at dusk near the small Agasthya shrine on the summit of Agasthyamalai (April 2002). Perhaps the most unique unpublished image that I have from the Agasthymalai summit trips is the mountain shadow taken on the summit of Agasthyamalai. These were my pre-digital days and it was taken with a cumbersome, awkward looking box (a Noblex panoramic camera) with a rotating lens to produce an uninterrupted 11 cm long negative or positive image. To this day it, along with many other medium format slide & color negative images, sits awaiting my attention. My initial focus has been to present our pilgrimage to the peak in black & white and I have hesitated to mix it with the color work. Dawn is a magnificent affair and makes the stormy night worth all its fear and discomfort. As the rays of the new day begin to fill the sky, they paint the cirrus clouds in fantastic hues of gold and scarlet. A kestrel is hovering over the precipice near the summit and Grey-breasted Laughing Thrushes are chattering in the trees by the Agasthya shrine. Looking north, we are blessed with a view of the dark evergreen forests of the Mundanthurai range. The azure mountains stretching beyond the Shencottah gap and up towards the Periyar Tiger Reserve are imposing. Then something incredible happens. The sun, just a hair above the horizon, projects the conical shadow of Agasthyamalai into the light haze of the west, creating a surreal pyramid-shaped shadow that shifts as I walk along the summit. This is a phenomena often observed by mountaineers on high peaks at sunrise. It is well recorded on Sri Lanka’s Adam’s peak, but this is the first time I’ve seen it happening in the Western Ghats. The magical shadow doesn’t last longer than ten minutes and disappears when the sun slips behind a low cloud. Mountain shadow on Agasthyamalai in the Ashambu hills of the southern Western Ghats. The image was taken on Fuji Velvia 120 film using a Noblex panoramic camera mounted on a tripod. To the right of the shadow is the slope of Agasthyamalai and then the ranges to the north. Visible in the center and below are the lower forests of Peppara Wildlife Sanctuary. Another view of the vertical western face of Agasthyamalai seen from Athirumalai. Shot on 35mm color film with an SLR (February 2002). 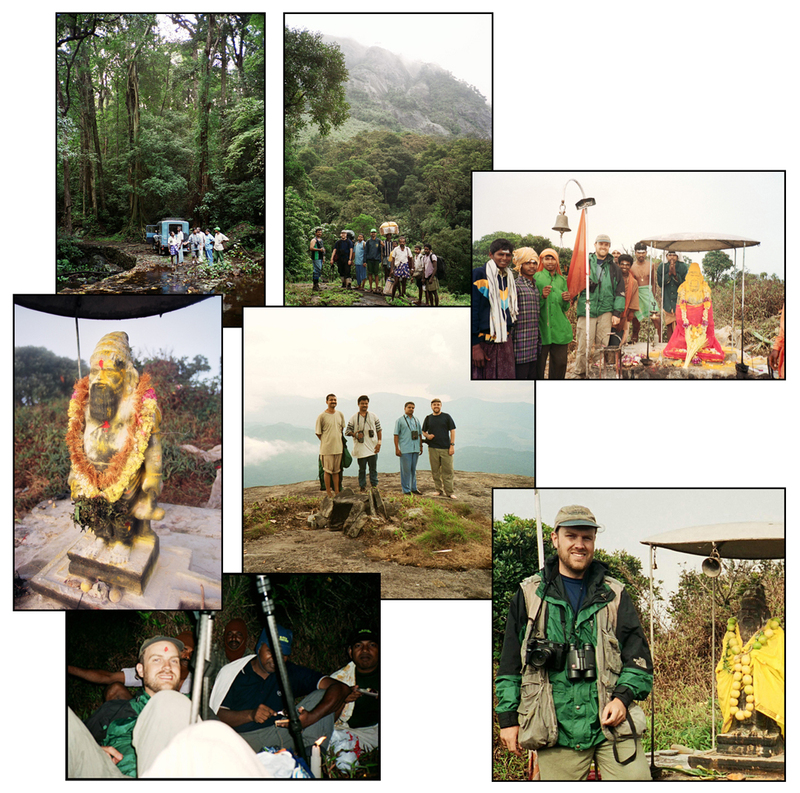 Snapshots from three summit attempts to Agasthyamalai in 2002. Clockwise from upper left: Getting to Kanakati, at a puja ceremony with other pilgrims, with the modest Aastyar statue, sheltering with the Daniel brothers and Dr. Abraham under a tarp held up by a tripod and umbrellas, Agstyar statue close up. With Dhonavur friends after reaching the summit in April 2002. Leaving to return...Agasthyamalai and its western face, seen through spring foliage from the north west of the peak in Peppara Wildlife Sanctuary.